The monthly Bank of America Fund Managers Survey (FMS) is perhaps best known for exposing Wall Street's cognitive dissonance, if not schizophrenia, to the world because while on one hand survey respondents cry over soaring corporate and global leverage, at the same time they rush to 3x oversubscribe a bond package with the "worst-ever covenants" (using other people's money of course) despite knowing it will all end in tears. However, while generally perceived as a novelty sentiment index to be faded, with little information value, the monthly survey does provide some useful indicators of herd sentiment, two of which have been especially notable in recent years, namely what perceived as the "biggest tail risk" for the market, and what is "the most crowded trade" at any moment. 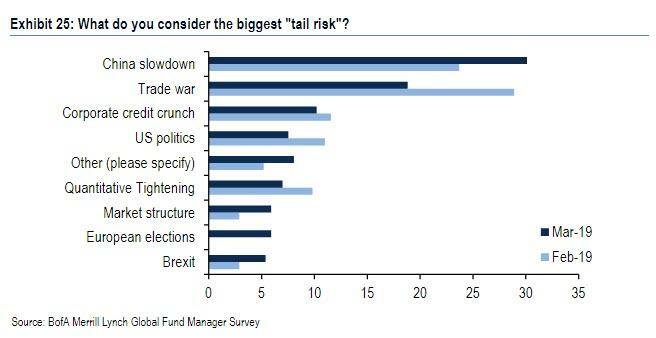 Of note, there were two major surprises in the March edition of the FMS - which polled 186 participants with $557BN in AUM - when it comes to what Wall Street saw as both the "most crowded trade" as well as "the biggest tail risk" this month. As a reminder, the dominant concerns of investors since 2011 have been Eurozone debt & potential breakdown; Chinese growth; populism, quantitative tightening & trade wars. 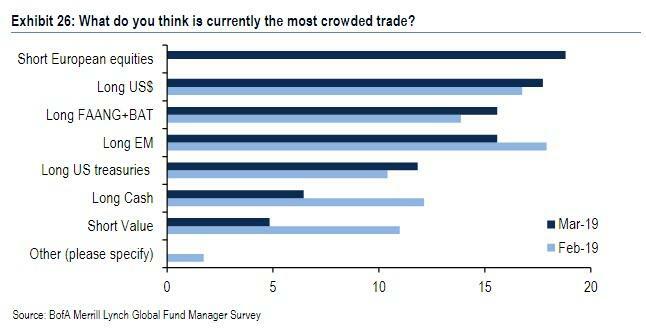 However, in March, Wall Street traders saw a brand new "most crowded trade", one which had never appeared previously in the survey: namely Short European Equities. 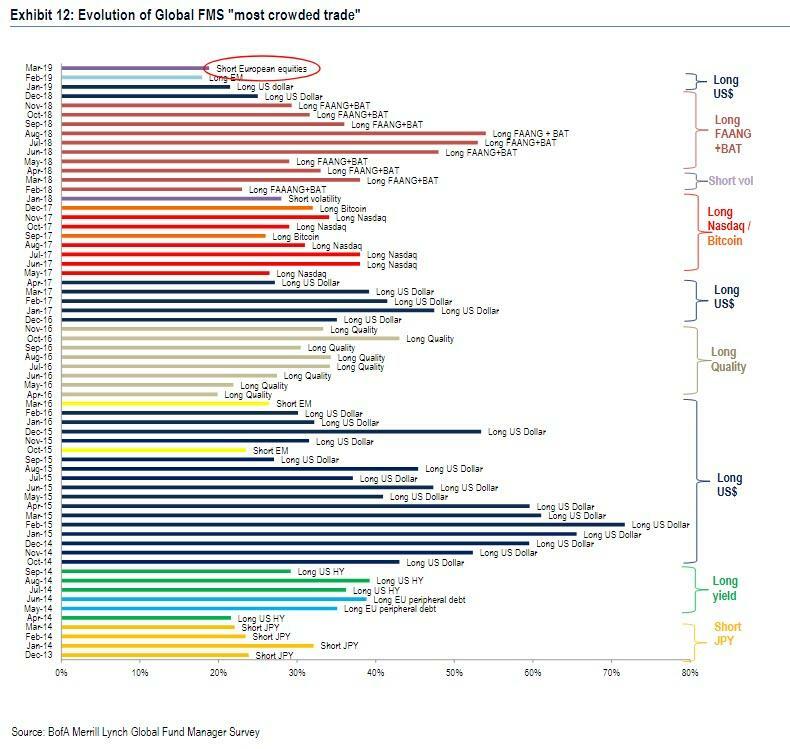 The trade replaced Long EM (16%) which dropped to fourth; Long USD (18%) came in second and Long FAANG+BAT (16%) came in third, though conviction is low with only 3% separating the first and fourth most crowded trades. 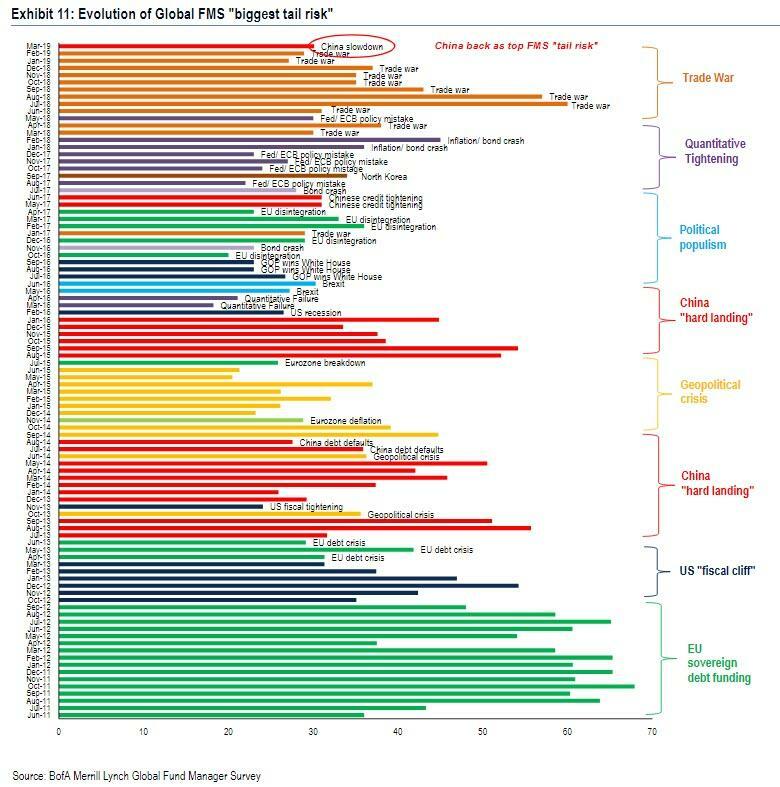 ...followed by a trade war (19%), which had topped the list for the previous nine months; third on this month’s list is a corporate credit crunch (10%). 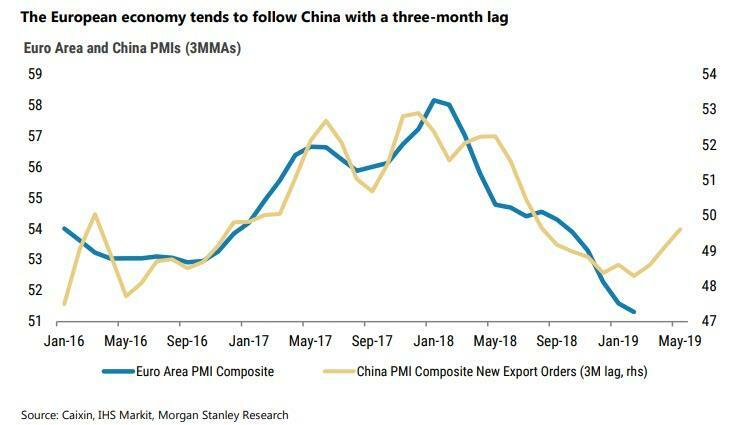 As we have discussed before, while there is little practical value to the above data, it does confirm that the easy money from shorting Europe - which may be poised for a significant rebound after having effectively entered recession recently but has seen its economic data slowdown moderate significantly, largely thanks to China's massive reflation efforts - has been made. Summarizing overall investor positioning, BofA notes that "the most crowded FMS trade is short European stocks; overvaluation of US$ is the highest since Jun '02; relative to 20-year FMS history investors long cash; "long stocks-short cash", "long EU-short EM", "long industrials-short REITs" are all contrarian." And yet, despite everyone being worried about China, its stock market continues to be the best performing major market of 2019 as foreign investors - and yes, US-based fund managers - continue to aggressively allocate capital to Chinese equities, in what is the latest confirmation that this survey is nothing but an exercise in hypocrisy, which exposes that while investors say one thing they do precisely the opposite.